Hard to find Tibetan Incense at a great price. True Tibetan incense, made by hand, used by monks, and offered to the world with the idea of promoting inner and outer peace with healing properties. These are powerful in their aroma and there intent is to purify and cleanse the atmosphere for deep meditation and prayer. It is believed that many of these dispel negativity and attracts positive energy for healing and peace. We have provided each of our selections with their descriptions. 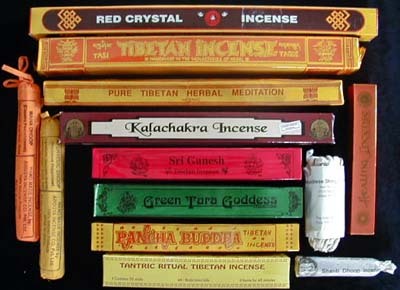 All are pure with only natural ingredients, no stick, and just pure incense in many different variations. Many items in this category are represented here in this picture. Pancha Budda 10" Box: 5 types asst.